Did you know Triangle Patterns can get you winning trades? Triangle Patterns are the simplest type of patterns to identify and put into action. Understanding these triangle patterns will enable a trader to spot the emerging trend in price of a stock/ index. 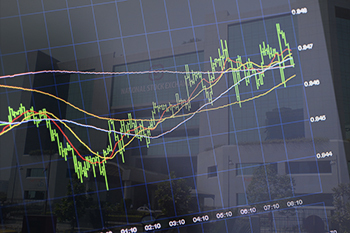 Any stock/ index follows through a pattern which can be tracked and analysed. There are numerous patterns which a trader needs to know to take informed decision on a trade. To start off, Triangle Patterns are the simplest type of patterns to identify and put into action. Understanding these triangle patterns will enable a trader to spot the emerging trend in price of a stock/ index. Triangles fall under the category of continuation pattern. For a triangle to be formed there has to be a previous trend following which prices turn sideways. Once this scenario is established, the triangles are formed. They start from the widest point and end at the narrowest point of the formation. Recognizing these patterns is very important for any trader. These patterns are easy to identify and they act as a highlighter on the charts indicating a potential trade. Triangles have good risk reward ratio and also provides concrete projected targets. A Symmetrical Triangle is formed when prices turn directionless or stock/index enters into a consolidation phase. During this phase prices start contracting until both the declining trendlines meet each other at a point called Apex. The outcome of this pattern can be either ways i.e. prices can either continue its previous trend and move higher or can reverse and breakdown resulting into a reversal of the trend. This pattern is normally seen in an uptrend and viewed as a continuation pattern. 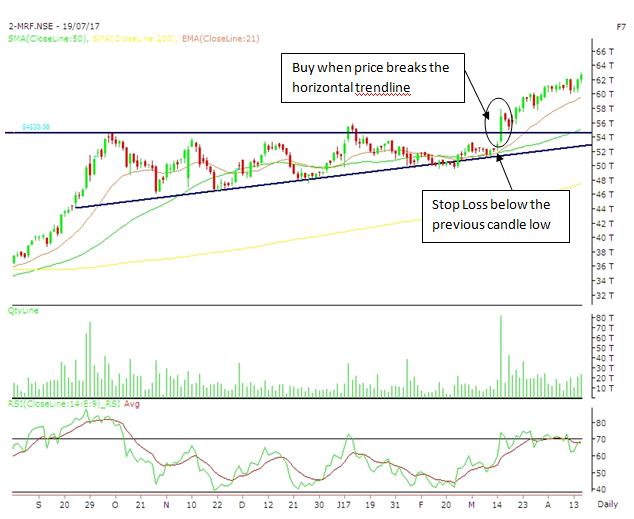 Ascending triangle is formed with a rising trendline that intersects with a flat horizontal resistance line. This happens when prices make higher lows whereas there are multiple highs which are almost equal. In addition, if it is seen in a downtrend then an Ascending Triangle pattern should be paid attention to as it can act as a powerful reversal pattern. This pattern is normally seen in a downtrend of a stock/ index. It is opposite of an Ascending Triangle Patten. It is formed when prices make lower tops whereas there are multiple lows which are almost equal. 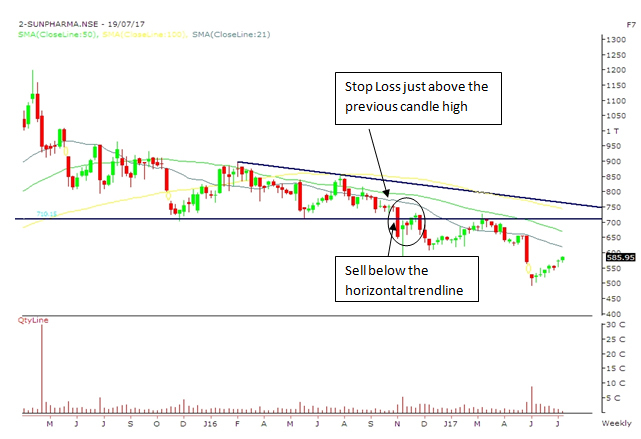 If seen in an uptrend it should be paid attention to as it can act as a powerful reversal signal. Conclusion: For any trader it is of paramount importance to be able to identify patterns and trends of a stock/ index. This will enable the trader to take an informed and calculated decision pertaining to trades as well as risk reward. 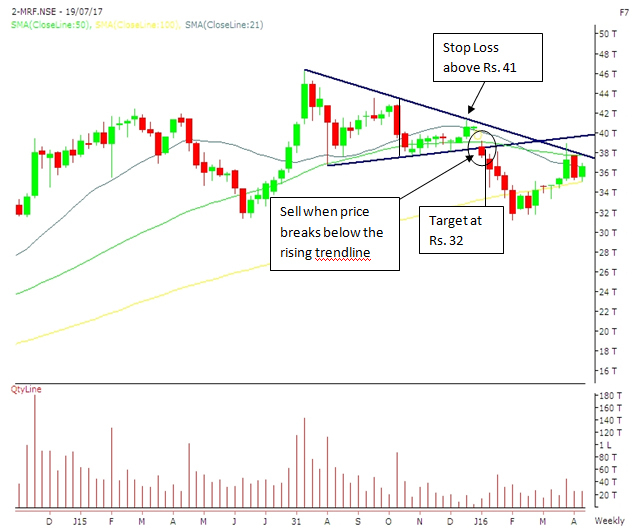 Triangle patterns are the easiest way to identify an upcoming move in a particular stock/ index. Every stock will create these patterns on charts and if you master the art of identifying them, it will definitely help you get winning trades.